The buzz on arrival at CES Unveiled, a pre-CES event aimed at journalists and analysts, was the new OLED Lenovo laptop, a first in the PC and displays industry. The screen resolution was so beautiful that I fear that people will spend their time looking at it rather than working. That was almost the only old tech company out of the 180 exhibitors. Withings, an established player, has launched a new temporal smart thermometer with 16 sensors. Mother, which caught the imagination in CES 2014 with its array of sensors for tracking activity in the home, has come of age with Silver Mother, essentially the same hardware, but with clever marketing targeting the care of elderly relatives. A new start-up called Hydrao has launched a smart showerhead and related app which allows you to track your usage of water in the shower – the colour on the showerhead changes at preset levels and an app gives you warning – teenagers beware! There is a UK tech as well. A company called Smarter has developed a nice range of products, some already well-established in UK retail, that make your fridge smart, detect noises in the kitchen (eg the washing machine has come to the end of a cycle) and weigh products in the fridge to let you know if you have run out – all at an attractive price point of under £100. I end day 1 with Lowe’s, the only retailer to be present at CES Unveiled. Lowe’s has led the way in the US in smart home with its Iris range, and announced today that it is moving into professional monitoring. With a partner it will operate a service of emergency response to alarms for fire, carbon monoxide, and intrusion in return for a monthly fee. This is the way that Dixons Carphone in the UK has said that they are going, and the latest CONTEXT Smart Home Survey (to be published on Thursday 7th January at our Retail CEO breakfast in CES) shows that there is an appetite in Europe for similar services. 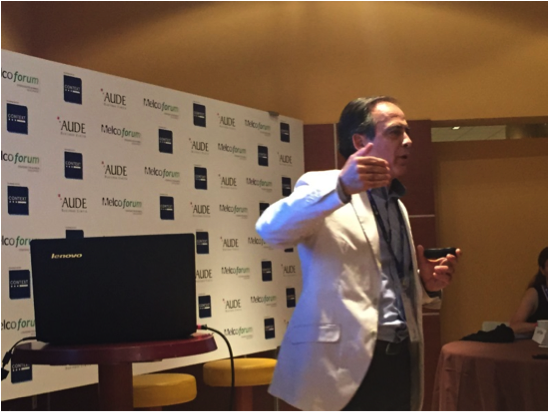 “You aren’t disruptive innovative until you create a need” said Jorge Lang the head of Innovation at Intel Spain as part of his masterclass at this year’s Melco Forum in Valencia last week. “The innovation manager challenges the status quo, and sometimes loses friends in the process.” “Disruption is what it is all about”. Improving products sustains companies and is evolutionary but disruptive innovation is what really counts. Jorge Lang highlighted three factors which impact the success of innovative products – technology, user experience and the business model. In his opinion, the challenge for smart home is not technology – it is to find a business model where people are prepared to pay for the new products. Innovation is about creating an environment where people take risks. This year Intel is innovating helping people move from 18 passwords per person to a product which bypasses password. We are trying to give you more freedom such as no cable to power the TV. Jorge gave us a glimpse into the future – we are moving away from the age of the typewriter to the age of the personal assistant. We will relate and talk to our home computers and to our smart homes like Hal in the iconic film “2001 A Space Odyssey.” Already there is digital signage with video which learns from your body language. The future is individualised customer marketing because of the availability of data. Following our previous posts, which pitted Microsoft’s Band against Apple’s Watch, we turn this week to the theme of wearables and wellbeing. ‘Wellness’ was once a straightforward matter of kale concoctions, Pilates posturing, and Whole Foods foraging. No longer. Wellness is wearables. Wellness is big data. Why? Well, amongst much uncertainty as to what, exactly, wearables have to offer, wellbeing and health have emerged as key value propositions. The pitch goes something like this: ubiquitous wearable sensors are set to revolutionise healthcare by providing real-time, ongoing, and personalised data points; health professionals will be able to gain a complete picture outside of clinical settings and adjust treatment plans accordingly; individuals will be able to acquire new perspectives on their relevant behavioural patterns (think diabetics learning about how their dietary habits affect their blood glucose levels). Indeed, Microsoft argues that its Band’s real value is realised through Health, a “cloud-based service that helps you live healthier by providing actionable insights”, drawing in information from “a variety of devices and services to give you insights into your entire day across nutrition, work, fitness and rest.” And it’s already a crowded market. Several tech companies are vying to develop the health tracking ecosystem of choice: Google Fit, Jawbone UP, and of course, Apple HealthKit all propose to bring together data from your favourite apps and hardware. Wearables are growing up, graduating from glorified pedometers to bonafide health tracking devices. As Fitbit’s CEO, James Park puts it: “there’ll be a next big leap in benefits once we tie into more detailed clinical research and cross the hurdles and dialogue with the FDA about what we can do for consumers and what’s regulated or not.” Apple’s ResearchKit is already on the way to achieving just that. An open source framework that aims to bring iPhone owners and medical researchers together, it pushes the scope of wearables into new territory. Indeed, several big-name medical studies are already under way, establishing Apple’s sensors as research grade. Success in this field would bring huge rewards, enabling tech companies to tap into a multi-billion health market (some $6.3 billion are spent each year on blood glucose test strips in the US alone). What’s more, the chronically ill make for a loyal customer base. It isn’t like they can just decide to drop their wearables on a whim. And even for the healthy, unifying ecosystems such as the Apple HealthKit inaugurate a new era of intimacy and dependency, capturing ever more of our bio-digital identities.